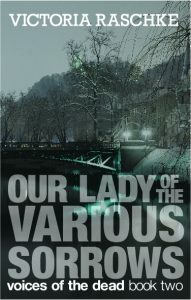 Our Lady of the Various Sorrows is off being edited. I got the digital proof for the ARCs today. I thought it would maybe feel old hat the second time. Nope. I still got chills seeing the wrap version of the ARC cover. It’s real, an artifact, proof that I have finished something. Twice. The book is set in the depths of winter, in that time when it feels like spring can never come. It’s fitting for Jo’s state of mind as she sorts out the aftermath of having her life turned upside down and shaken. Plus, it was great to work on a book with cold and snow in the merciless depths of a Southern summer. I’ll post links to the pre-orders for Our Lady of the Various Sorrows, as soon as they are available. You can definitely pick up book two without having read the first one, but I’m going to go ahead and say I think you’ll enjoy it more if you’ve already read Who by Water. The second book contains answers to lingering questions and puzzle pieces to collect as the series unwinds. If you haven’t already, please sign up for the newsletter at the bottom of or on the right side of the page for updates on releases, events, and special features for subscribers. You can also follow me on Facebook, Twitter, Goodreads, Instagram, and Pinterest. Thank you all again for your support, good wishes, and reviews. I have always written, because it’s necessary for my sanity, but it’s a completely different experience to have that work out in the world to share.